Midnight Moon is a 70 minute-plus collection of haunting, minimal, deep-of-the-night, mood-drenched pieces. This is the release on which Steve began exploring his own style of atmospheric, processed guitar-based zones, approaching the instrument as a new tool to create quietly moving moodscapes. An album of meditations on solitude and quiet introspection. Touching the ineffable, this music presents a meditation on solitude and quiet isolation. Atmospheric music in the true sense of the word. This slow swirling lattice of smokey melodic-harmonic patterns rises and falls out of the silence which becomes an equal component with the music. Midnight Moon will appeal to anyone who has appreciated the purely atmospheric side of Roach’s influential style over the last two decades. A stunning recording of quietly moving soundworlds, Midnight Moon is a 70 minute-plus collection of haunting, minimal, deep-of-the-night, mood-drenched pieces. The recording was conceived in 1998 when Steve began to explore his own style of atmospheric, processed guitar-based zones, approaching the instrument “with a beginner’s mind, the Tabula Rasa, or clean slate.” Steve comments, “I set off with no technical understanding or desire to develop in any sense of a conventional guitar player. “With this recording, I feel I am entering into a psychological landscape that is difficult to describe without characterizing it as ‘dark’ or ‘mysterious.’ I feel the metaphor of entering a vast cave is fitting, the sensation of going into new areas that pull you deeper and then deeper again. In that sense, it’s really about exploring your unconscious creative landscape through the music, as if the sound becomes the illumination of this process, like the subdued glow of a single torch flickering against cavern walls that have never been lit before. “During and after the recording of Dust To Dust, Roger King would leave his guitars in the studio. At a certain point, the impulse to pick up the instrument simply occurred. Up to that point, it was a foreign object. I started to explore and feel my way in the dark with the instrument, actually playing with very little light in the studio to enhance the exploratory state of mind. All the pieces were created in the late-night, early-morning hours at a time when I was clearly hovering in a hypnogogic state. Over time, I continued to discover and revisit the place that became Midnight Moon. I used the guitar as I do with all the instruments that I am drawn to, creating my own language and approach that serves the music in a directly intuitive way. In the end, it is the music that always matters. After extensive looping and processing, the sound has an indigo hue, often beyond recognition of what the original source could have been. The result is one of pure introspection, offering a perfect flow of mood-altering soundworlds for infinite repeat-mode playback. 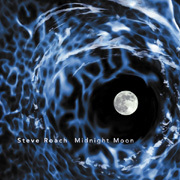 In a world obsessed with categorizing all aspects of artistic expression, Midnight Moon is a another offering to the unnamed, ineffable realm of pure ambient – atmospheric music, one that Steve Roach expresses with quiet nobility.